In 1535, French explorer, Jacques Cartier was the first European to see the territory which is now Vermont. In 1609, Samuel de Champlain traveled up the Richelieu River and discovered what is now known as Lake Champlain which is named after him. During the early 1600’s, the area was still a contested territory. In 1763, England was granted the territory via the Treaty of Paris and this ended the French and Indian War. The Green Mountains were then quickly opened to settlement and to squabbling between the colonies of New Hampshire and New York as to which had the proper claim to the territory then known as the New Hampshire Grants. The governor of New Hampshire granted land in the territory to settlers. New York, also claiming the land, granted it to other settlers. In 1764, King George of England ruled that New York owned the land. A group of New Hampshire settlers, the Green Mountain Boys, fought to keep their land and forced the New Yorkers out of the region. The settlers of the New Hampshire Grants united and on January 17, 1777, Vermont was declared an independent republic at a meeting held at Westminster and subsequently acquired its own minted coins and postal service. Vermont remained an independent republic until March 4, 1791 when it joined the Union as the 14th state. Vermont had settled the dispute with the New York in 1790 by paying $30,000 to the state. 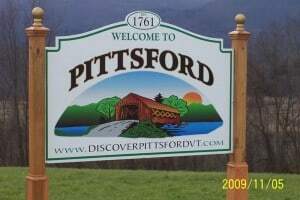 On October 12, 1761, The New Hampshire Royal Governor, Bennington Wentworth, granted a charter to a new town in New Hampshire Grants to be known as Pitts’ Ford which later changed to Pittsford. The name came from a ford on Otter Creek and named after William Pitt, prime minister of England at the time. That same year, 25,000 acres were granted to 63 proprietors. Half brothers, Gideon and Benjamin Cooley, settled here in 1767 as farmers. Clusters of sawmills, grist mills, tanneries, blacksmith shops and schools sprung up to support the community and Pittsford Village soon developed on the post road running north from Rutland. After 1795, Grangerville formed on Furnace Road, around the Granger family’s iron blast furnace and foundry. Many of the workers were Irish immigrants. After the War of 1812, French Canadian farmers arrived and settlement quickened for several decades. Sheep farming became the principal agricultural activity with the arrival of Spanish Merino sheep. Thousands of sheep browsed the logged off hills. Mills sprung up to treat the wool creating a major industry that lasted until after the Civil War. With the demise of sheep farming, dairy farming became the dominant occupation and the farmers were able to sell their milk to two creameries that were established in town. Florence farmers opened several small marble quarries in the early 1800’s. The marble industry grew changing Florence to a mix of farms and quarrying by 1850. By 1910, immigrant marble workers from many European and Scandinavian countries swelled the Florence population. They worked and lived in Vermont Marble Company owned quarries, farms and houses. The Florence mill, built in 1898-1902, sawed marble blocks, produced finished marble products, and shipped to markets via the Clarendon and Pittsford Railroad. During post Civil War prosperity, residential housing boomed from the 1870’s and late 1890’s. Successful farmers, lawyers, merchants, and doctors built new homes or remodeled old ones. Marble sidewalks, the Walker Memorial Building/Maclure Library, and the Pittsford Aquaduct system improved the Town’s appearance and life in general until a recession weakened the economy at the end of the 19th century. Electricity and telephones came to town in the early 1900’s. The Vermont Sanatorium, the new Town Clerk’s Office, and Lothrop School were erected, although many outlying schools remained open. World War I interrupted progress, followed by a surge until the 1927 flood and the 1929 Great Depression. Hard times lasted until 1941 when Pearl Harbor plunged us into World War II, followed by the Korean Conflict. In the 1960’s, we joined the Otter Valley Union School District, adopted a Zoning Ordinance, and built the Recreation Area. Designated an “urban community” since the 1980’s, farming has declined and forests are reclaiming pastures as we become a bedroom community with 70% of the working population employed outside of Pittsford. The town still maintains a largely rural appearance outside the Village, however, residential construction continues to encroach on agricultural land. The Town of Pittsford lies between the Taconic Mountains to the west and the Green Mountains to the east. Otter Creek, which winds its way between Florence and Pittsford, is the second largest watershed in the State of Vermont which flows into Lake Champlain. Florence and Pittsford are located within the Vermont Valley biophysical region. Furnace Brook also flows southwesterly through the town and has provided the source for power in the past. On the west side of the Otter Creek, in a wide valley, is the Village of Florence, a rural and industrial zone of Pittsford. While the valley floor is generally within the 100-year flood plain, there are several farms in operation. Because of its history as a source of marble and crushed stone, the valley is also Pittsford’s primary industrial area.